I seem to break wheel studs fairly frequently (this is the 2nd time it has happened on this car), so I’d be willing to bet someone else is going to have this problem in the future. So here we go! Before starting you need to buy a replacement wheel stud. 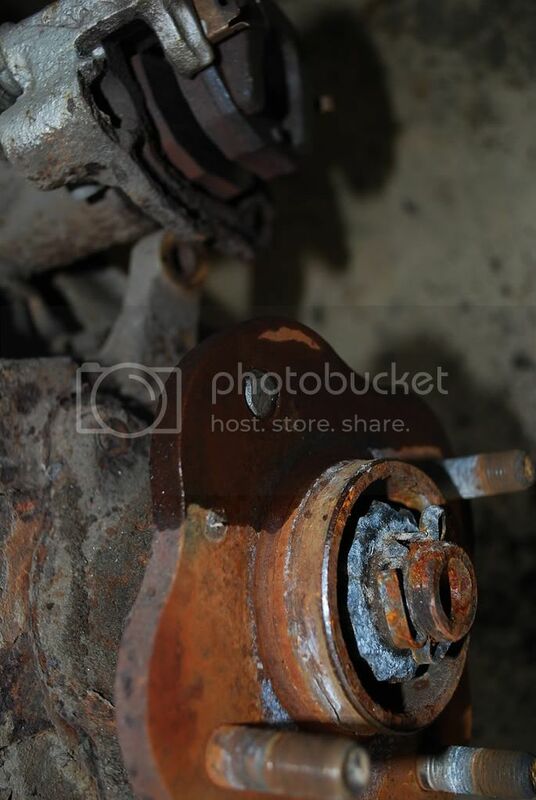 Step 1: Identify broken wheel stud. Chances are, if it broke, it broke while driving. If that is the case, kiss your lug nut goodbye. Next, prepare to remove the wheel by securing the other ones, and breaking your lug nuts free while the wheel is still on the ground. Now jack up the car. In my case, I lost a rear wheel stud, so I jacked it up by the pumpkin. (I also lost a wheel stud on the drivers side a couple years ago). 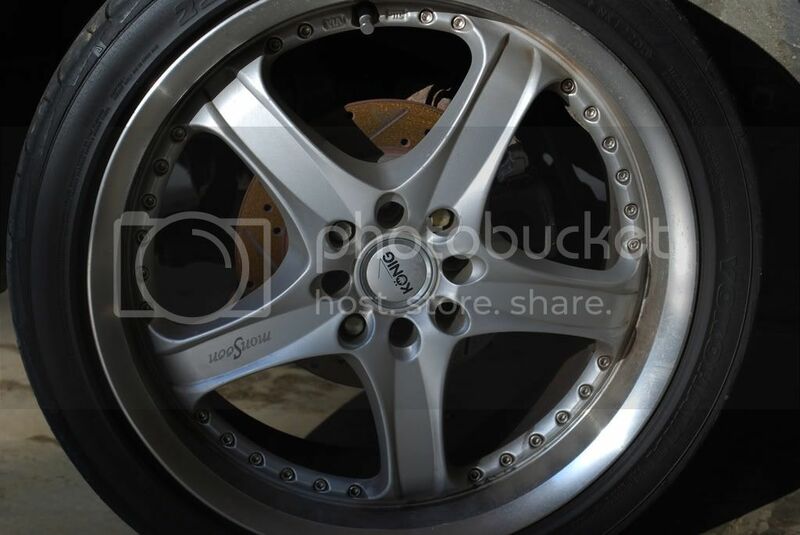 Remove the wheel by removing the remaining lug nuts. Ah yes, there she blows. 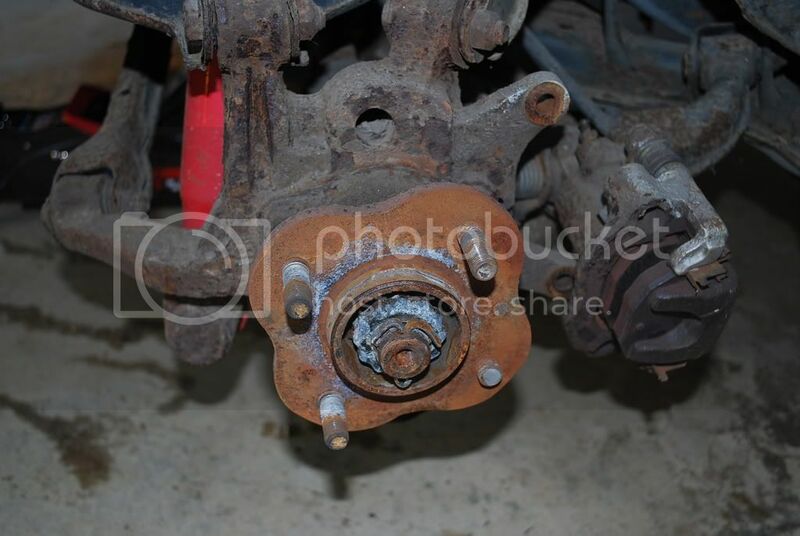 You are going to have to remove the rotor, so for that, pull off the brake caliper via the 2 17mm bolts holding it to the spindle (note the position of the ratchet. That is the bolt to remove, as well as 1 more on the bottom). 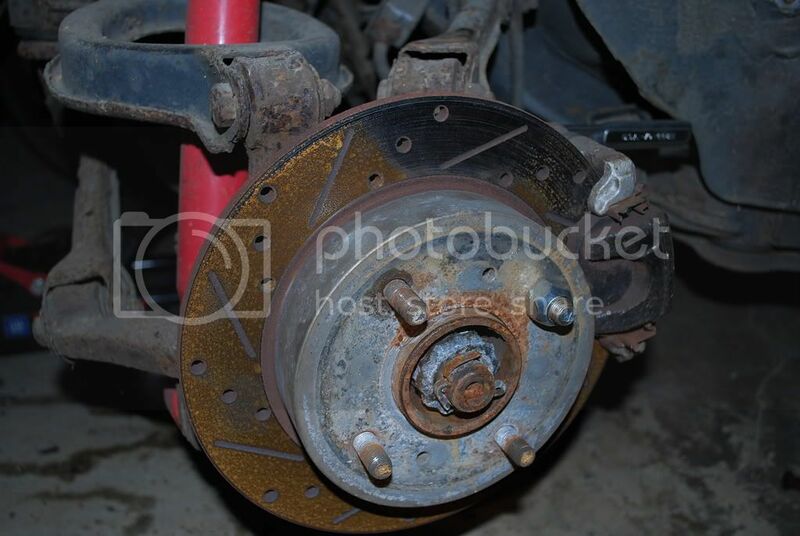 Pull the caliper out of the way, and remove the rotor. Note the small pile of rust starting to form. Now comes the fun part. Locate your maimed wheel stud, and pound the living crap out of it with a hammer. Hit it axially towards the center of the car. Soak it with PB blaster if it’s being stubborn. Chances are, at this point, you have hit the wheel stud so hard, you have musroomed the top of it a little bit. This is when you will need some sort of drift to punch it out the rest of the way. I used a bigass shoulder bolt that I happened to have in my pocket from work. Now, bust out your new wheel stud (with thread pitch M12x1.25), available at most auto parts stores. You will also need an open lug nut (also M12x1.25). 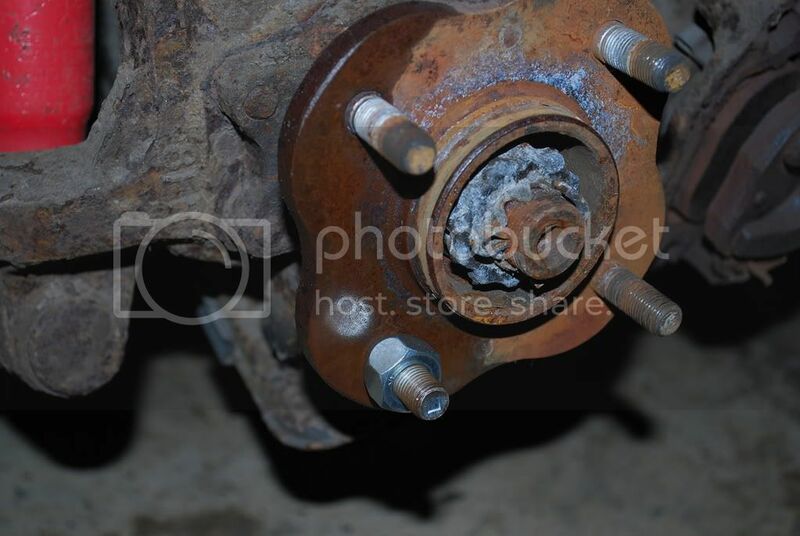 Feed the wheel stud through the back of the hub, and screw down the lug nut til you get all the way to the hub. Screw it good and hard. 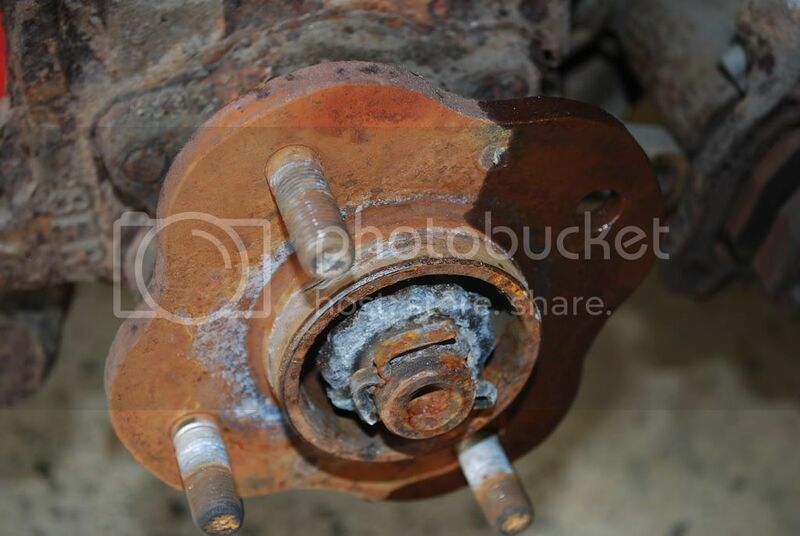 This will start to pull the wheel stud through the hub, and secure it. 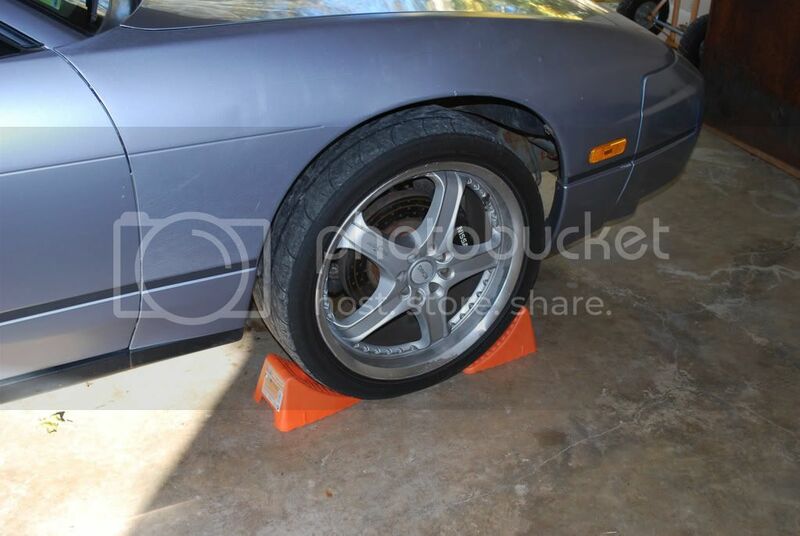 NOTE: Add a couple washers behind the lug nut to reduce friction. I didn’t, but you should. Chances are, at this point, you need more beef/threads to pull it through the rest of the way. 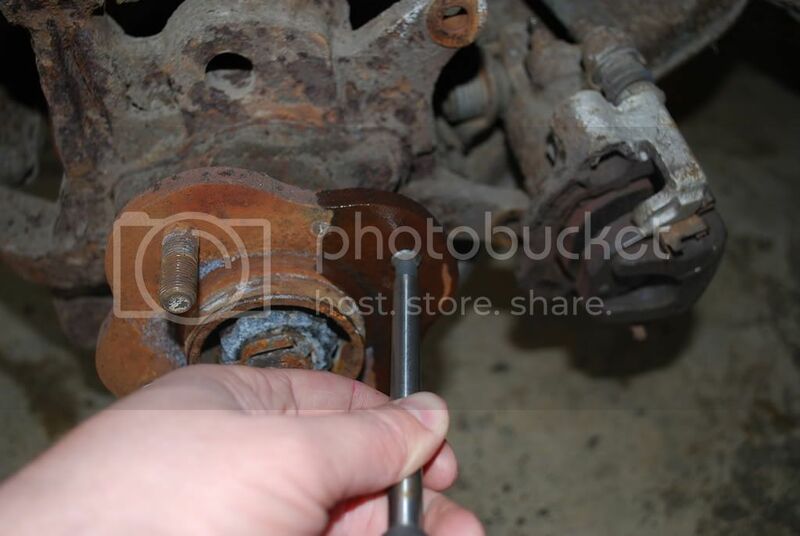 If you can get to the back of the stud, give it a whack or two with a hammer while tightening the lug nut. This will “seat” the stud properly. Put your rotor back on once the back of the stud is flush with the back of the hub (compare it to the others, you can do this visually or by feel). At this point you are essentially done. 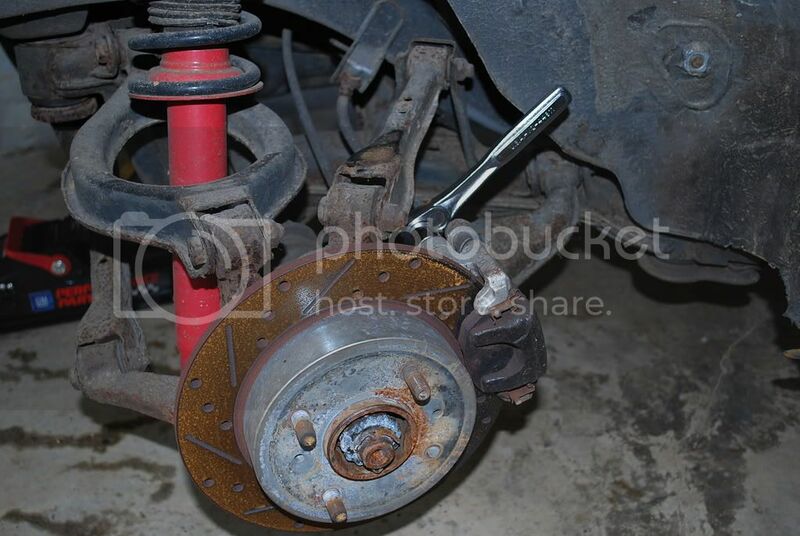 Just put your wheel back on, lower the car, and tighten the bolt. 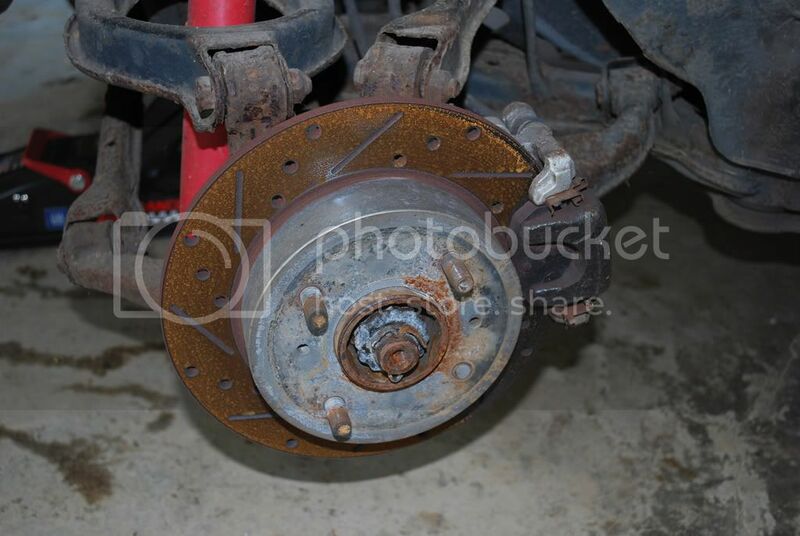 Loosen it up, and tighten the rest of the lugnuts in a star pattern like normal. Pat yourself on the back, you just saved yourself roughly $50 by not bringing it to a shop. Total repair time should take about an hour if you work at a leisurely pace. 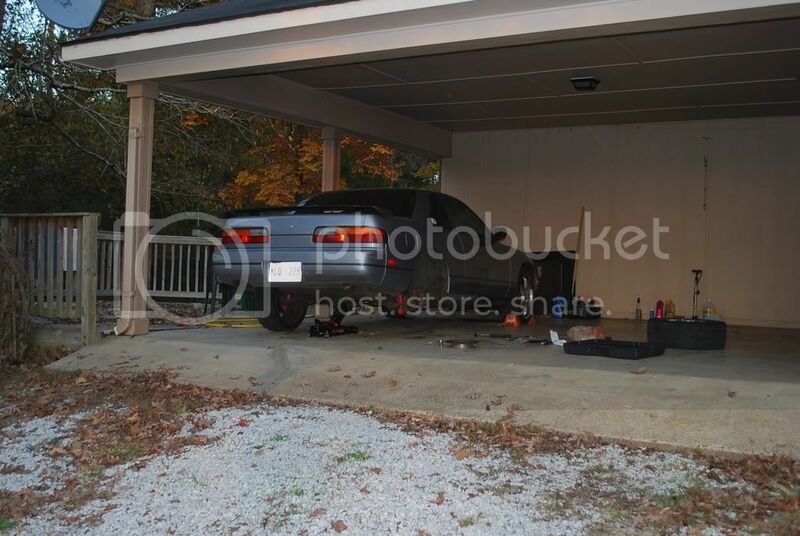 There’s a lot more articles about 240sx repair, modification, and maintenance at 240sx Tech!